The day before you intend to make the hash, preheat oven to 300°F. 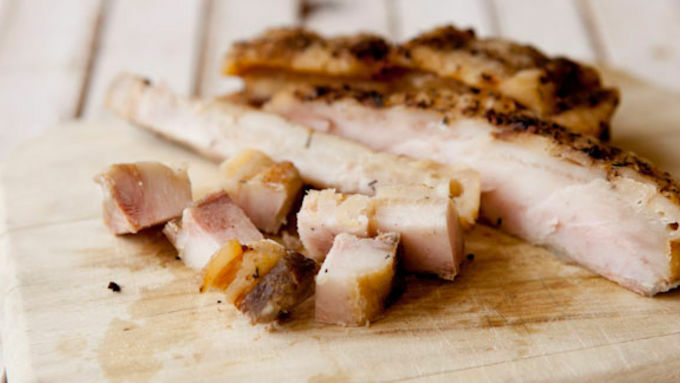 Score pork belly with a sharp knife, being careful to just score through the fat. Try not to cut too deep. 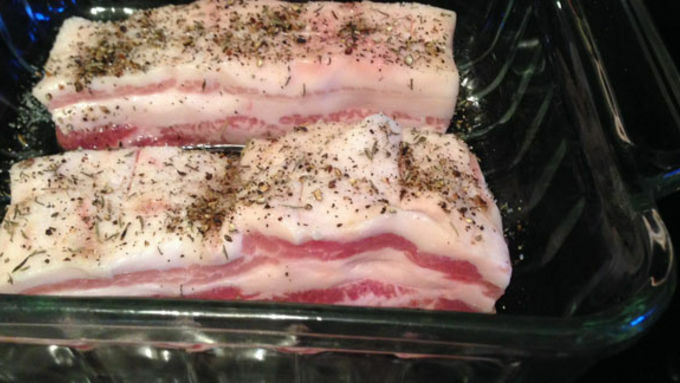 Season belly liberally with dried thyme, salt, and pepper, and place it in an 8x8-inch baking dish. Ladle a cup of hot stock around the pork belly. Roast pork belly covered with foil for two hours, then remove foil and roast for another two hours. Remove belly from the oven, let cool, and store overnight in refrigerator until needed. When you're ready to make the hash, remove belly from the fridge. If there is skin on the belly, you can either cut it off or leave it on. If you leave it on, the cubes will have a very crispy cracklin crust. Cube belly into 1/2-inch cubes. 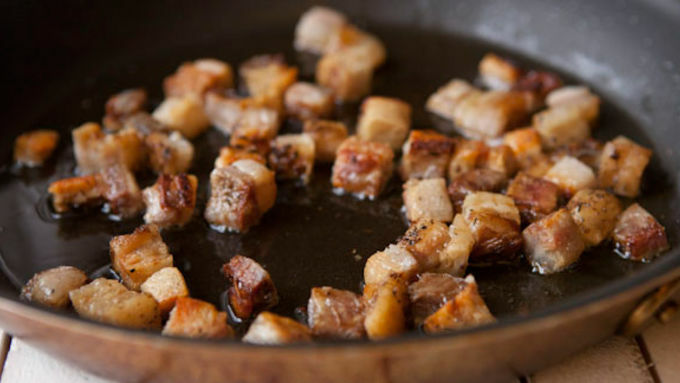 Add pork belly to a large skillet over medium heat and cook until pieces are crispy, about 10 minutes. Remove belly from the skillet. There should be a few tablespoons of rendered fat in the skillet. Leave it! 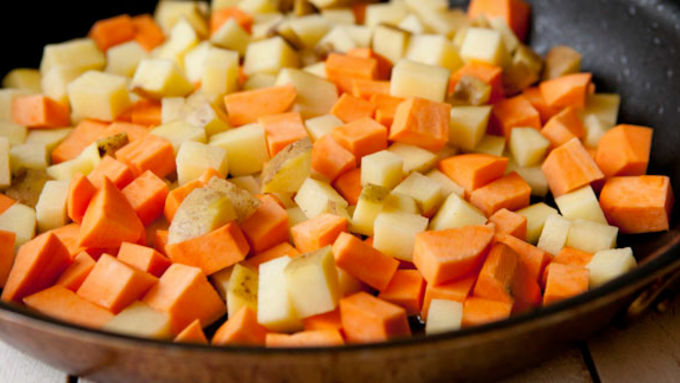 Add the cubed sweet potatoes and Yukon gold potatoes to the skillet with the fat and let cook, over medium heat, until they start to brown on all sides, another 10-12 minutes. 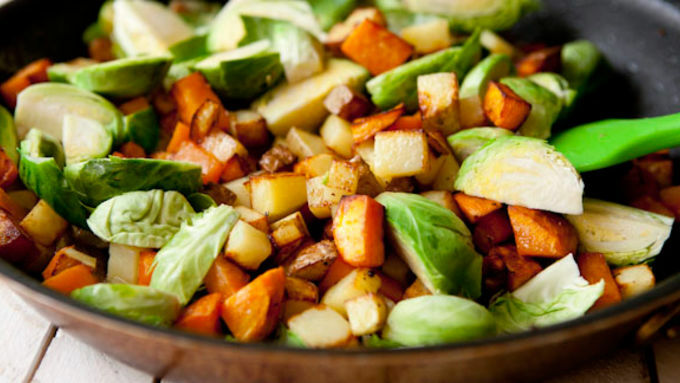 Add quartered sprouts to the skillet and continue to cook until they are tender and lightly browned, another 6-7 minutes. Add pork belly back in and season the hash with salt and pepper. 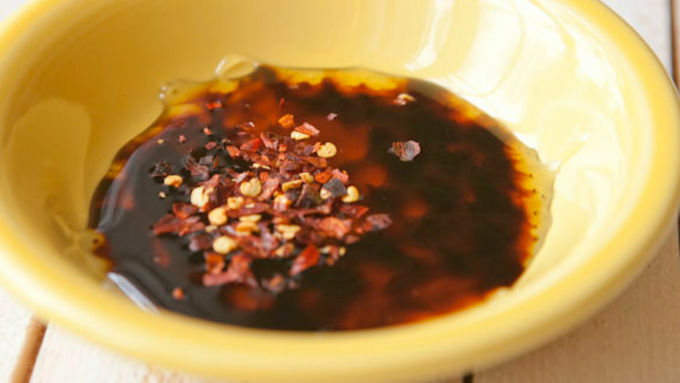 In a small bowl, stir together molasses, honey, and red pepper flakes. Set aside. Keep hash warm over low heat and fry four eggs however you like. 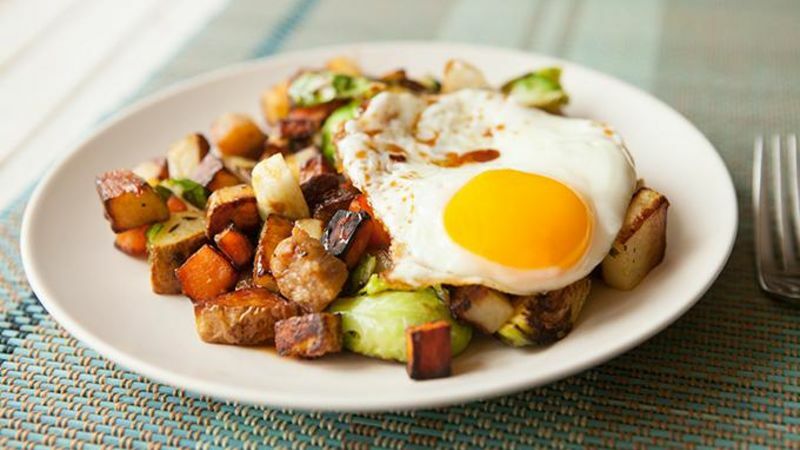 Divide hash evenly between plates and top each plate with an egg. Drizzle molasses mixture over each plate and serve immediately! Quite possibly the best hash you'll ever eat. Slow-roasted pork belly fried together with sweet potatoes, sprouts, and a spicy-sweet glaze. I bet you’ve had pork belly before whether you realize it or not. If you cure it and possibly smoke it, you have bacon – everybody’s favorite food group. But if you can get your hands on it before it gets baconed (ask any decent butcher), you can roast it low and slow and then it turns into an entirely different thing. 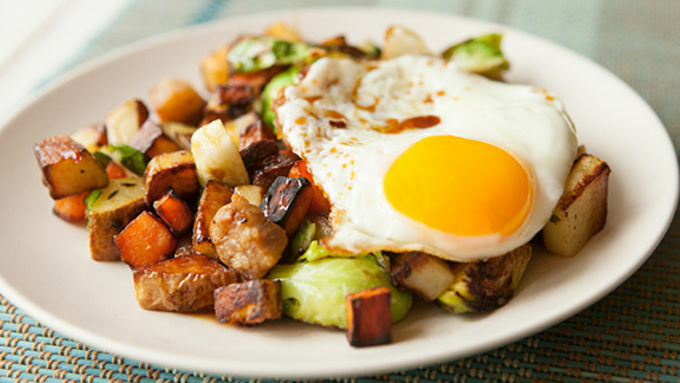 Toss the roasted belly with some root vegetables, and you too can make this sweet potato and pork belly hash! Also known as the best thing you’ll eat this week. Try this out if you want to experience hash heaven!